This quick and easy salad buffet menu is a great choice for entertaining any time of the year. 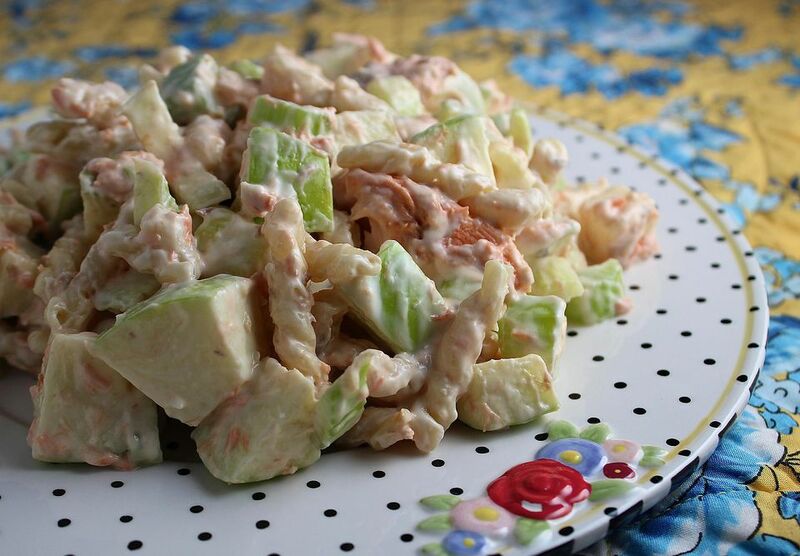 These salad recipes taste wonderful, are better if made ahead, and last for several days. Keep in mind that the following recipes are totally versatile. Add or subtract meats, fruits or veggies to your taste, change the dressing or seasoning, add or subtract cheeses and herbs. Substitute shrimp, use pork instead of chicken, use different types of pasta, or add asparagus or peppers. You can also leave the meat out entirely for vegetarian versions. The salads are so flavorful I promise you no one will miss the meat! One trick for cooking pasta is to salt the water well. It makes a huge difference in the pasta flavor, and doesn't really increase the sodium content of the finished dish. I rinse the cooked pasta very briefly, for only a few seconds, then add the dressing. The warm pasta absorbs the dressing this way and the finished result is much more flavorful. Stir the salad after about 30 minutes in the refrigerator so it stays creamy. I also always thin mayonnaise with milk for the dressing recipes. It blends much more smoothly with the pasta or potatoes and the end result is creamy and silky. And with everyone watching fat grams, try blending low fat mayo, plain yogurt, or no fat mayo with the real thing. No one will be able to taste the difference. Salads are also great for a buffet because they usually improve in taste and texture if refrigerated for a day or two. Finally, remember to be creative and enjoy yourself! All you need to add to this buffet is some wonderful chewy bakery bread, or make your own focaccia or other quick breads, and offer some brownies and cookies as dessert. Mix and match the following recipes and you're well on your way to an easy buffet party! This fresh tasting salad packs a kick of flavor! It's pretty too, and easy to make. You'll love it. A dressing of pesto, yogurt, and mayonnaise coats chicken and lots of fresh veggies in this delicious salad. This superb salad combines a marinated chicken mixture with black beans, avocados, corn, and salsa. Mint in the dressing makes this salad taste wonderfully fresh; and the combination of strawberries and asparagus in the salad is superb. A vegetarian main dish salad is a nice choice for any salad buffet. This one, with black beans, barley, and wild rice, is very hearty. These pretty little muffins are easy to make and fun to eat. This sweet and tender quick bread is the perfect accompaniment to the cool and savory salads. Refrigerated pizza dough is the easy beginning for this cheesy and fragrant bread recipe. I love this recipe for tender, creamy, and chewy brownies. You could use chopped macadamia nuts or pecans instead of cashews if you'd like. This super simple cookie recipe is great for a baker's first foray into the kitchen. Because they bake at a lower temperature than ordinary chocolate chip cookies, these cookies have a very even texture and crispness. If you eat them right away, they are crisp and chewy. If you store them in an airtight container, they become tender and chewy. Cobb Salad - a Delicious American Classic!